Glass wear. 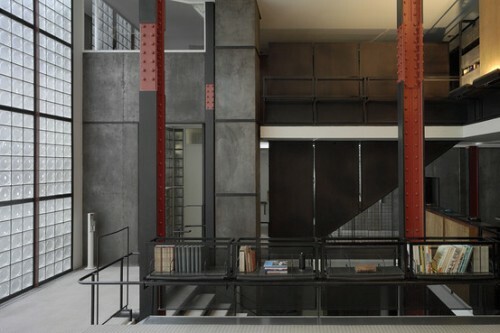 Alistair Gordon visits the entrancingly translucent Maison de Verre in Paris, Pierre Chareau‘s 1928 house of glass blocks, and speaks with current owner Robert M. Rubin about his ongoing restoration of the early modernist icon. Here’s a preview of Gordon’s feature that will appear in the next WSJ Magazine. Steely resolve. The Calatrava-designed PATH hub for the World Trade Center is now over budget to the tune of $180 million, reports DNA. The stratospheric overrun is due in large part to the decision to use extra steel to “harden” the building for security reasons. The Port Authority Board passed the revised budget on Thursday morning, promising to bankroll the extra costs with a contingency fund. Featuring…foamcore! San Francisco’s Museum of Craft commandeers a space near the Moscone Center for a pop-up installation that presents architectural model-making as a form of craft. The show offers a glimpse into the process of 20 notable SF-area architecture firms, writes the San Francisco Chronicle. Awards go immaterial. Producers Bruce Cohen and Don Mischer talk to the Hollywood Reporter about the set design for this year’s Oscars (airing this Sunday), revealing that they’ll rely on projections to create a constantly changing, animated environment within the Kodak Theater. Architect David Rockwell, who designed the sets in 2009 and 2010 (and snagged an Emmy in the process), this year passed the torch to production designer Steve Bass.